The Eastern spadefoot (Scaphiopus holbrookii) is a rare species in New England, listed as either threatened or endangered in Connecticut, Rhode Island and Massachusetts. 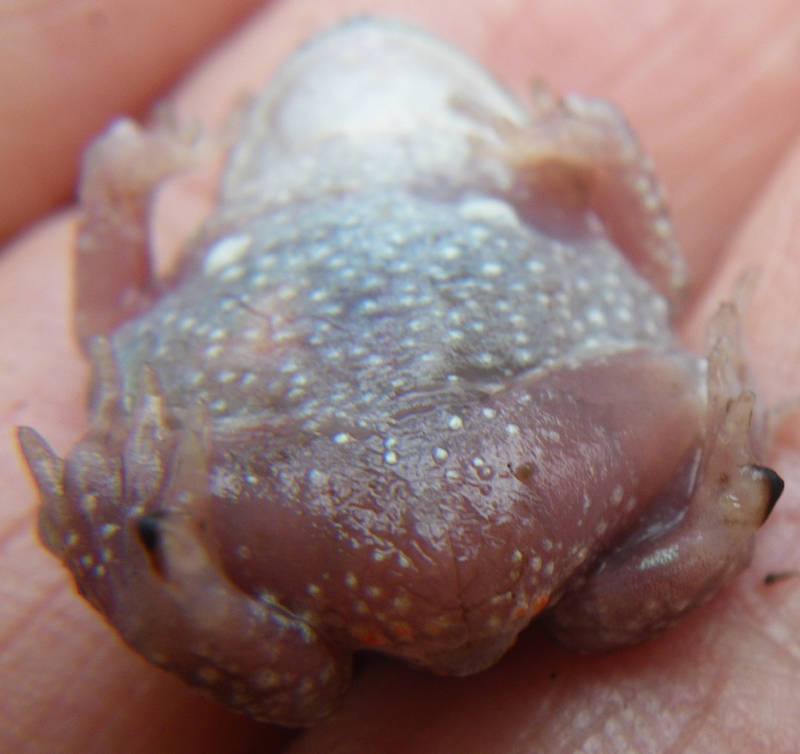 Most often encountered during warm spring rains when they raucously and frenetically engage in mating, spadefoots had evaded our late summer and early fall hatchling searches for decades until this Wednesday. They surprised us as we patrolled a diamondback terrapin nesting site, looking for hatchling emergence holes and tracks of emerging hatchlings. The weather was gray overcast with an occasionaly light drizzle with the temperature in the mid-60s. 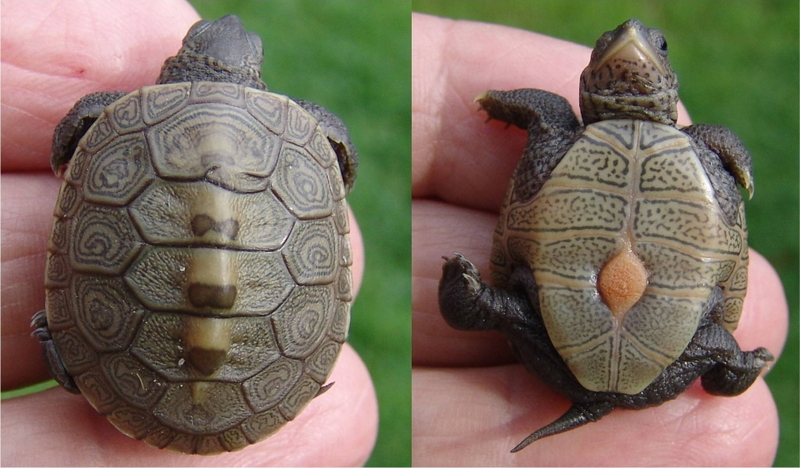 The best way to identify a hatching terrapin nest is to spot an emergence hole from which the first babies escape. 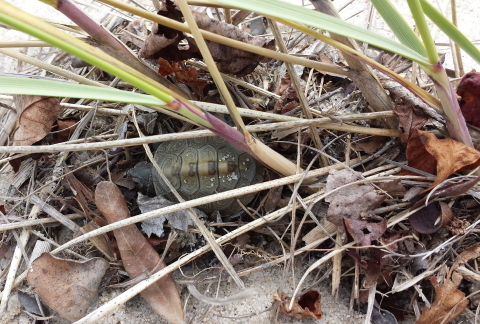 As we crisscrossed sandy dunes abutting a lush salt marsh, Sue Wieber Nourse discovered an “emergence hole.” As she gently excavated the hole to examine the egg chamber with her fingertips, she surprisingly felt a soft spongy critter rather than hard shells or egg shards. 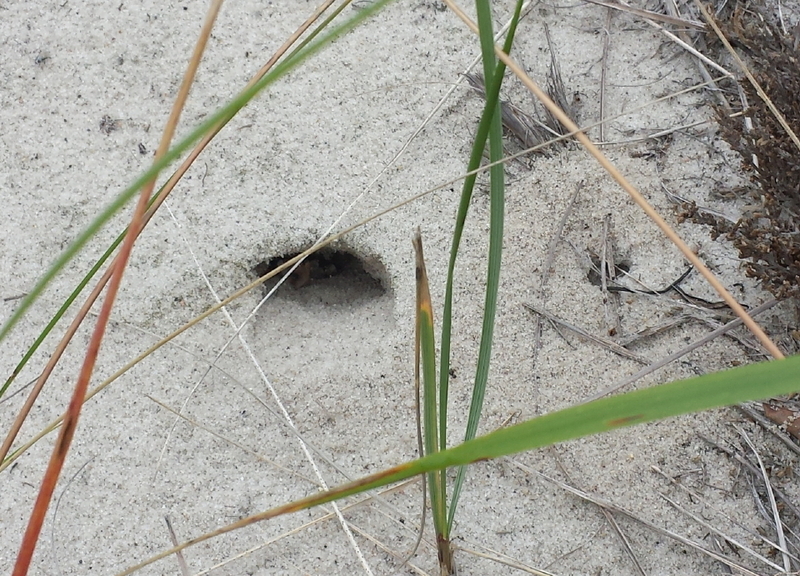 What looked exactly like a dune terrapin emergence hole proved to be a spadefoot burrow. 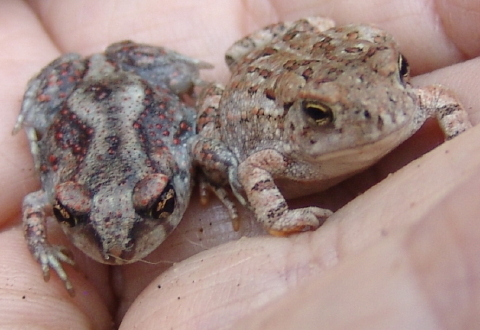 Sue Wieber Nourse encountered three more nearly identical “emergence holes” in these dunes, one occupied by another spadefoot and two holding Fowler’s toads. 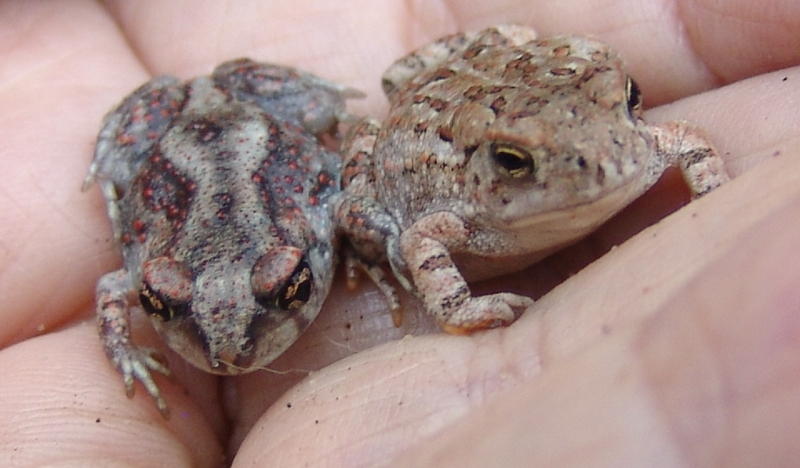 These tiny toads were all the same size, less than two inches long. Each of the spadefoots had the characteristic distorted hourglass design on their backs and stared back at us with cat-like rather than toad-like eyes. They also sported an eponymous dark, sharp ”spade” on the bottom, interior side of each back limb (see above). The image above presents a closeup view of the left rear limb with a clear view of the dark, sharp eponymous “spade” that lends its name to this species. This film clip offers an excellent perspective on how the spadefoot uses these sharp rear “spades” to dig backwards into the sand and to disappear from sight in little over two minutes. 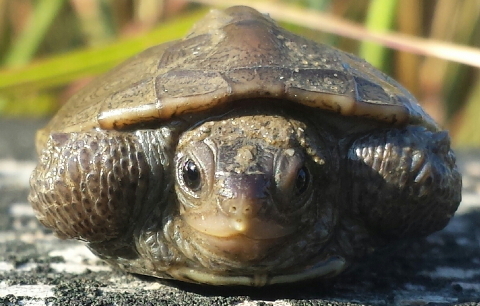 Turtle Journal’s Sue Wieber Nourse confirmed the existence of terrapins in Sippican Harbor in the late 1990s when she discovered a hatchling at the Old Schaefer Oceanology Lab and observed adults snorkeling in the estuary. As the inaugural holder of Tabor’s Jaeger Chair for Marine Studies, Wieber Nourse advanced original terrapin research and conservation in Buzzards Bay through a prestigious grant from the National Fish & Wildlife Fund. 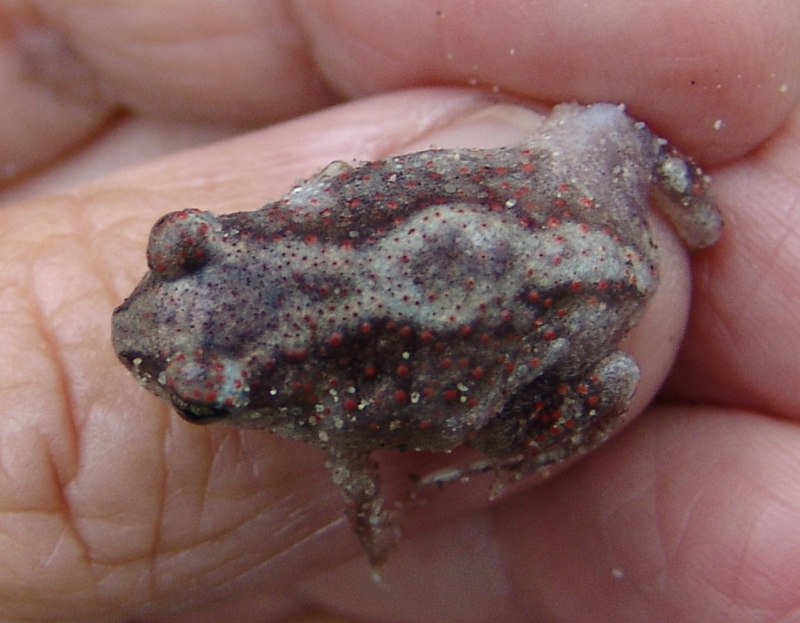 She and her students identified the shore immediately surrounding the Schaefer Lab as a key nesting site for this threatened species and formally reported this scientific finding to the Massachusetts Natural Heritage & Endangered Species Program. This morning Wieber Nourse found the first emergence hole midway between the lab and the beach. She excavated to discover two perfect hatchlings remaining in the nest, one viable egg, egg shards from six emerged hatchlings, and three undeveloped eggs. The beautiful hatchlings were in perfect physical condition. Their yolk sacs were mostly absorbed. 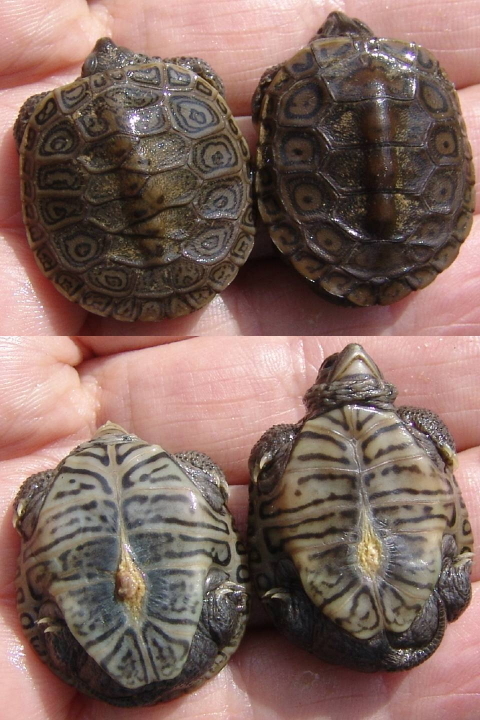 Both babies sported carapace anomalies with extra scutes; nothing that will affect their survival, but still worth noting as a potential identification mark when we see these babies again as sub-adults in another four or five years. Wieber Nourse found a second emergence hole a little closer to the beach. In this nest, Sue discovered another viable egg and the egg shards from 12 hatchlings that had already emerged. 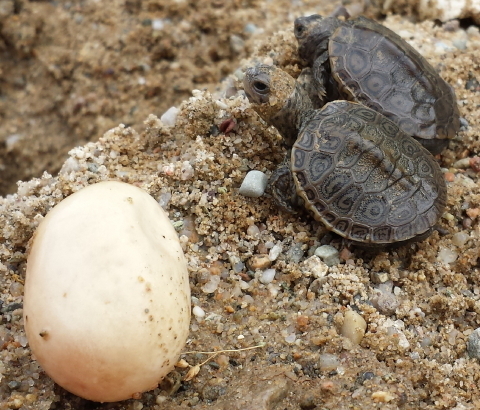 This morning’s discoveries, plus an additional Schaefer Lab nest being protected by the Turtle Journal team, confirm the critical importance of this nesting site for survival of the Sippican population of threatened diamondback terrapins. Turtle Journal’s Sue Wieber Nourse found the first diamondback terrapin hatchling at the Hammetts Cove nesting site in Marion Wednesday morning. 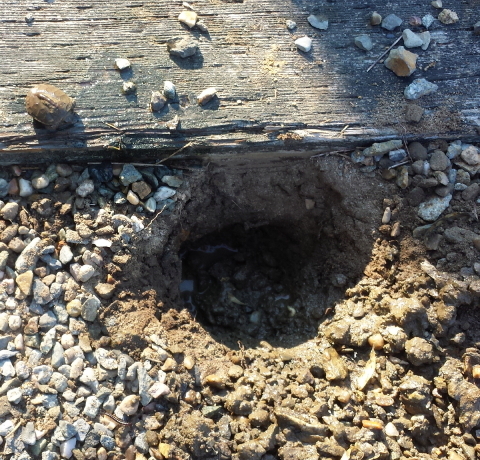 Sue spotted an emergence hole at the bottom of stairs to the compacted gravel pathway leading to the community boat dock in the Cove development. When Sue excavated the hole, she discovered shards of two hatchlings that had already emerged, two infertile eggs, three hatchlings that had been devoured by fly maggots while still in their eggs, and a lonely little hatchling workings its way to the surface. This pathway had traditionally served as prime nesting habitat for diamondback terrapins in the Hammetts Creek estuary off Sippican Harbor. 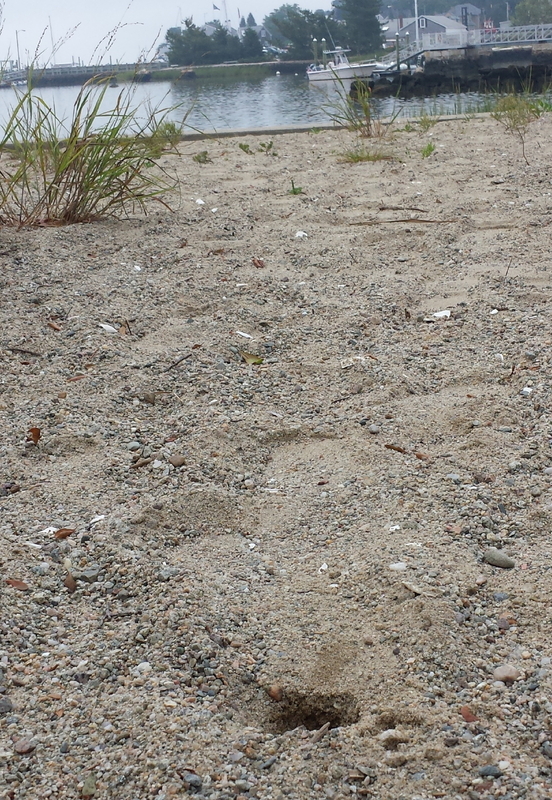 More recently, the pathway was compacted and graveled by the Cove development, creating a significant obstacle to terrapin nesting at this site. Still, tough old females can’t be easily discouraged and they continue to dig through sharp gravel and ground packed as hard as concrete. 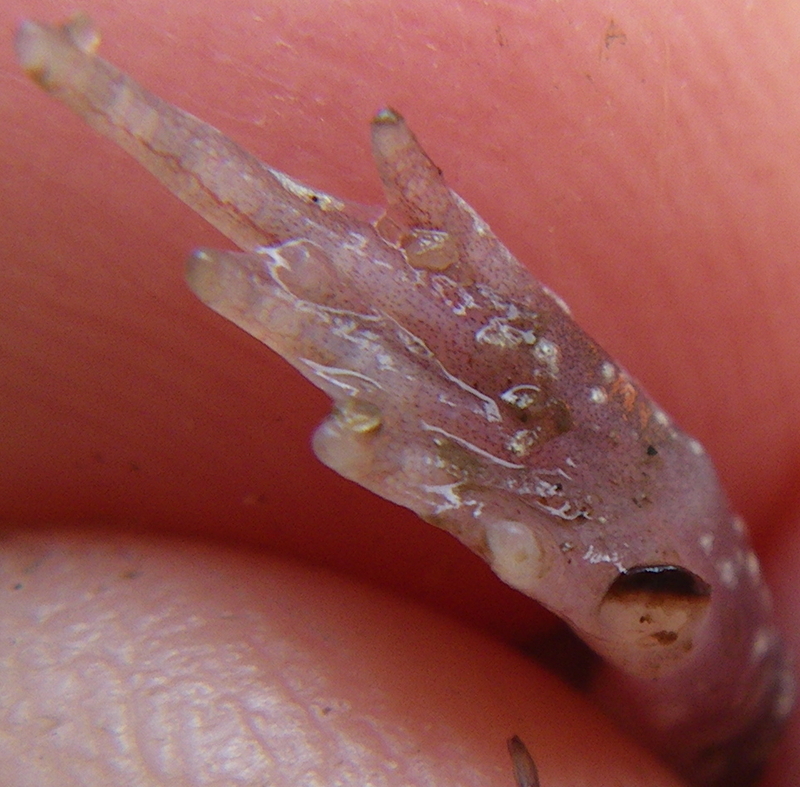 For 1/4 ounce hatchlings, though, tunneling back to the surface can be quite a feat. Usually, they must wait until drenching rains soften the sand above them. When hatchlings linger in their pipped eggs and nest too long, fly maggots attack, devouring them before they can escape … as they did with three of this hatchling’s siblings. 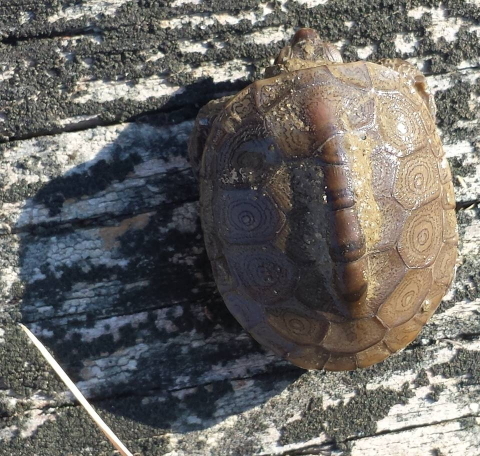 Lucky for this little baby, Sue was on hand to give it a boost to the surface, help it escape from the maggots and release it into the safety if the nursery salt marsh abutting Hammetts Creek. 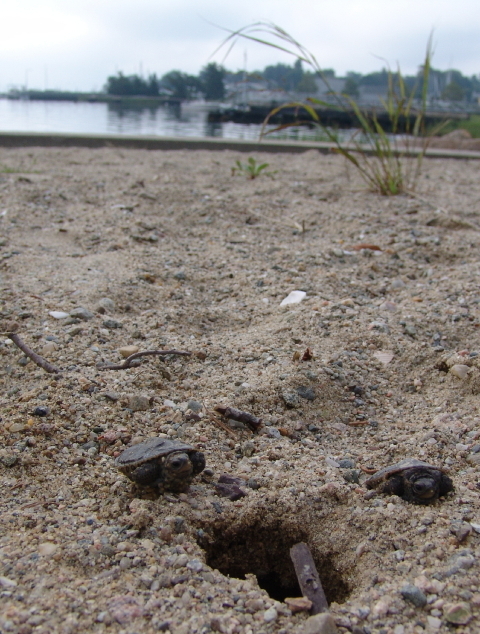 After a long, hot summer baking under steamy sands of a SouthCoast barrier beach, the first diamondback terrapin hatchling of 2013 emerged Monday afternoon. Piercing its eggshell with a razor sharp egg tooth at the tip of its beak, this 1/4 ounce, inch-long dynamo tunneled to the surface. In glaring sunlight, the tiny turtle scrambled across dunes, seekiing safety in the salt marsh where it will spend the first three years of its life, hiding from predators while it reaches hockey puck size and its shell hardens from potato chip crunchy to rock solid. 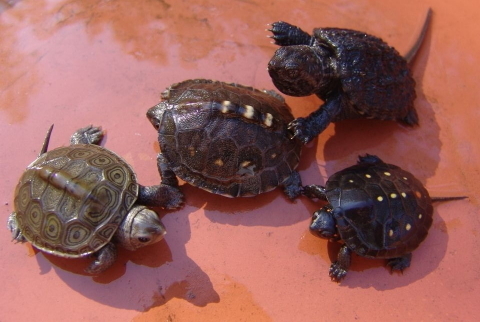 Back in springtime, every turtle’s thoughts turned to love and securing the next generation of shelled critters. In late May and early June, female terrapins swam ashore from Buzzards Bay and Cape Cod Bay to revisit their natal nesting spots with near perfect site fidelity. Similarly, snapping turtles and painted turtles and spotted turtles and rare red-bellied cooters left their ponds and creeks and wetlands to lay nests. Box turtles came out of the woodlands to find sun-soaked spots in gardens and driveways and neighborhood lawns to deposit their clutch of eggs. And while we humans savored summer sunshine as we surfed and fished and grilled and campfired and golfed and sailed, those few turtle nests that had eluded spring predators cradled eggs that incubated a few inches under our toes in the searing heat. (Not only does heat incubate eggs, but nest temperature also determines the gender of the hatchlings with warmer temps yielding females and cooler producing males.) Then, when beach plums begin to ripen along the East Coast, the first hatchlings of the year start to emerge. 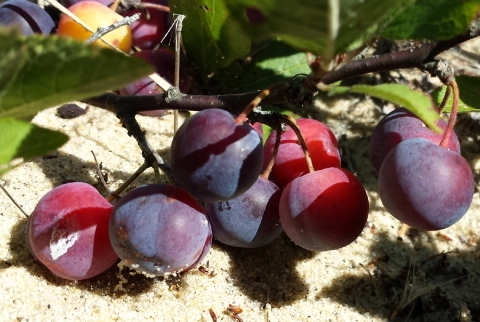 This last week with beach plums beginning to change hue from yellow and red to a deep, inviting blue, Turtle Journal’s Don Lewis and Sue Wieber Nourse have been patrolling coastal nesting sites. Monday afternoon they discovered the first definitive tracks of an emerged hatchling in the noon-day sands of a barrier beach in Marion. They followed the tracks until they disappeared and then began searching nearby until they discovered an elusive diamondback terrapin hatchling “hiding in plain sight,” perfectly blending into the vegetative debris at the base of a beach grass clump. To the untrained eye, this tiny baby turtle seemed like just another wind-blown leaf. 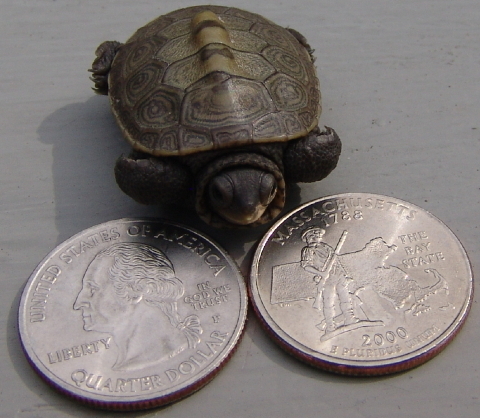 About the size of a U.S. quarter, tiny terrapin hatchlings are extremely vulnerable to a host of predators. The most dangerous moments of their lives comprise the trek from nest to safety in the nearest salt marsh where they hide for their first three years of greatest vulnerability. As many as 90% of turtle nests are eaten by predators immediately after being laid or just as they to begin to hatch. 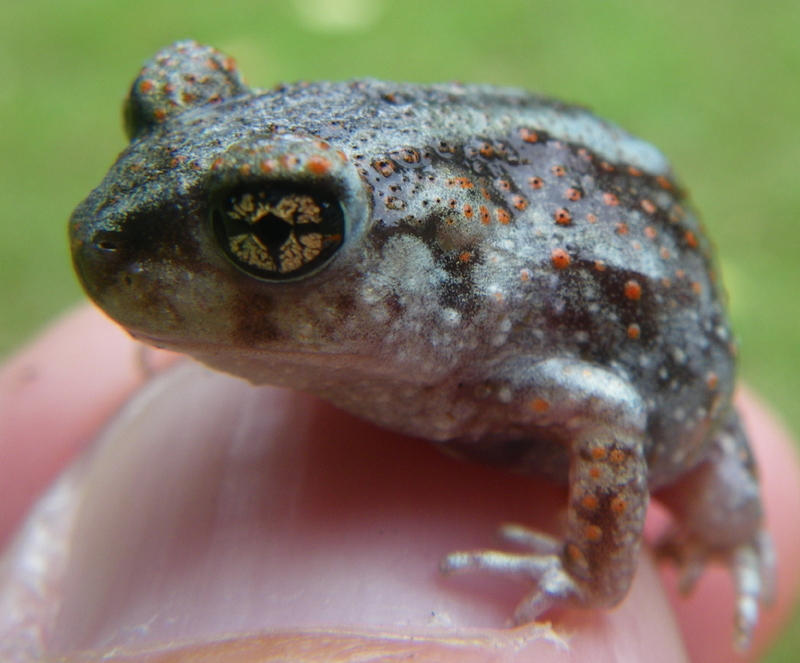 Emerged hatchlings face equally improbable odds of survival with estimates of only 1-in-a-thousand to 1-in-250 likely to reach adulthood. And with human intrusion into their nesting, nursery, mating and foraging habitats, the odds for turtle survival remain bleak … without a conservation assist. 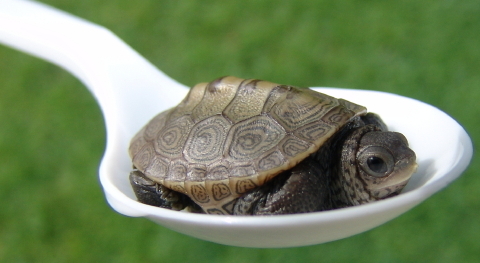 Once the greatest threat to diamondback terrapins was a haute cuisine palate with thousands of barrels of turtles shipped to metropolitan restaurants in the last century. While largely protected today, terrapins are still being driven toward extinction in many communities by coastal development. Development has accelerated loss of shoreside nesting habitat and nursery salt marshes. Human activity has intruded into formerly isolated mating aggregations. Once bountiful foraging areas have been depleted and polluted. Unlike their ocean-going sea turtle cousins, terrapins are non-migratory and must live in shallow coastal waters within shouting distance of humans; yet, so shy and elusive, terrapins are rarely seen. Without a conservation strategy to balance the scales, terrapins can easily and quickly and even unknowingly be extirpated from one estuary after another. 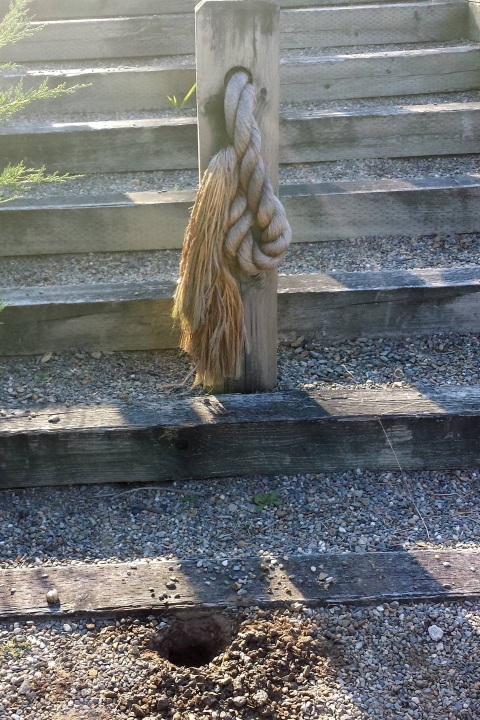 In Massachusetts, they are listed as threatened; in Rhode Island, they are an endangered species. In the arduous trek from nest to salt marsh, many hatchlings lose their lives. Most succumb to predators; others to fatigue and dehydration. It’s a long, hard scramble to reach safety and camouflage of the marsh grasses. The little critter discovered Monday afternoon already showed signs of exhaustion and dehydration from the midday sun and steamy dune sand. Lewis and Wieber Nourse decided to rest and rehydrate the terrapin baby before releasing it back into its natal salt marsh. Rehydration and a head-start in reaching the safety of the marsh greatly increase its odds of survival. From now until October frost forms on pumpkins, turtle hatchlings will be emerging in Massachusetts; diamondback terrapins on the coastline, box turtles in backyards, snappers around any pond or creek, spotted turtles near wetlands and bogs, and red-bellied cooters at Plymouth County lakes. During the next ten weeks, look down at the unnoticed world around your feet. Watch the lawn as you’re mowing. Check the driveway as you move the car. If you find a hatchling and you’d like advice on how to tilt the scales in favor of its survival, call the Turtle Journal team at 508-274-5108. 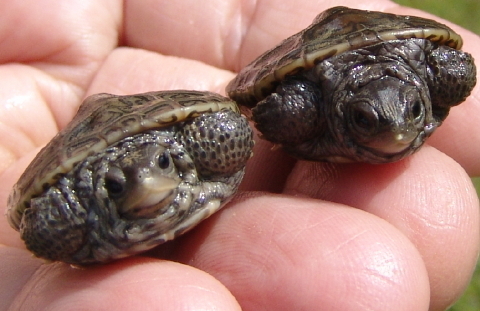 Because of the unique reproductive strategy of turtles, saving just a few extra hatchlings each year can have a huge impact on the survival of these charismatic wild creatures for future generations. 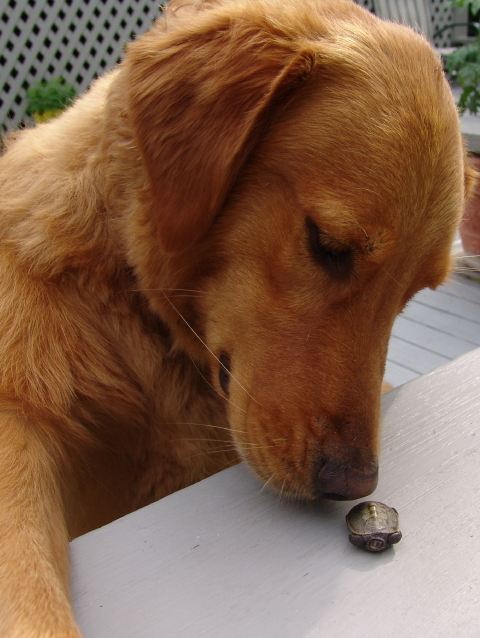 Many adventurer, outdoor enthusiast, scientist, teacher, oceanologist and nature lover has been inspired by an early life, surprise encounter with a hard-shelled critter in backyard or beach, pond or ocean, that sparked a lifetime of exploration and discovery. 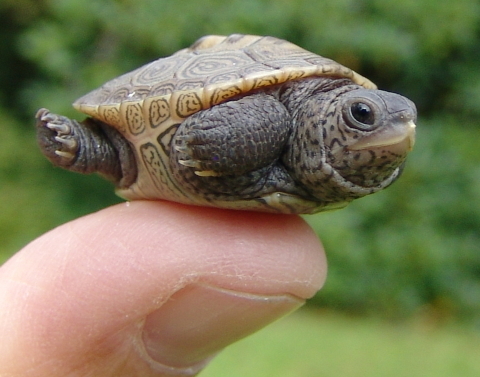 You can help create tomorrow’s explorers by saving today’s world one tiny turtle at a time. Rufus bade farewell to the tiny hatchling, wishing it godspeed as it hides from predators for the next three years in a nursery salt marsh. You are currently browsing the Turtle Journal blog archives for August, 2013.